Few people can say they’ve climbed to the top of Victoria Peak in just two days, and even fewer can say they’ve walked across the entire country in less than a week, but Rowan Garel can, and he’s done it despite not having the ability to see! The courage and bravery of the inspirational fourteen year old seems limitless and has done so much for the visually impaired in Belize by raising awareness and much needed funds, yet, he’s set and ready to do more… now he’s getting ready to bring his determination and efforts to La Isla Bonita and ‘Walk Across San Pedro’. Rowan has shown that by putting fear and regret aside you can achieve great things regardless of the challenges you may face, and despite being born without the ability to use his eyes, his efforts have raised thousands of dollars for the struggles of the visually impaired in Belize. During his walk across Belize, young Rowan was able to raise over $74,000 for his cause and became an inspiration to his many friends and supporters and indeed the entire country for the courage he has shown. He did, however, have a goal to reach $100,000 and Rowan is not one to sit back and let his dreams pass him by. Rowan is sure that by bringing his efforts to the community of San Pedro his will certainly be able to reach his goal; proving to everyone that you can achieve the thing you put your mind to as long as you choose not to give up. 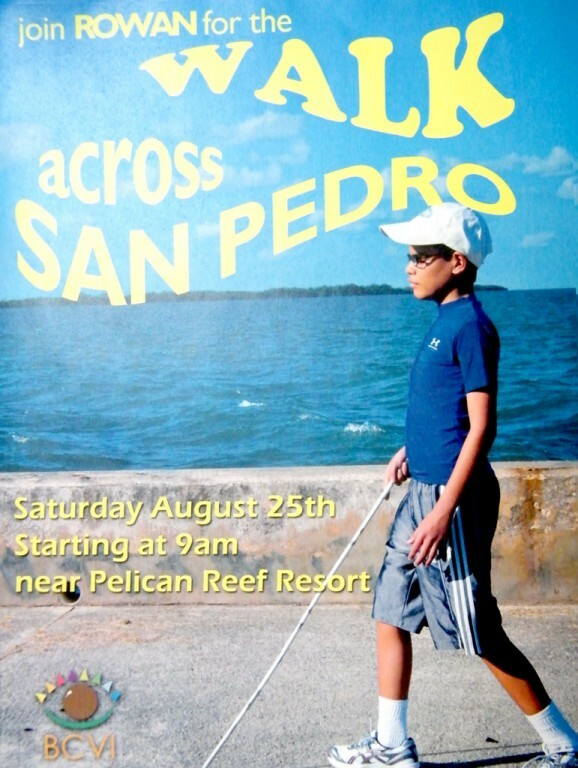 On Saturday, August 25th Rowan will begin another step in his inspirational journey to help blind children in Belize starting at 9AM near Pelican Reef Resort on south Ambergris Caye ending at the Boca del Rio Bridge on the north end of San Pedro. Everyone is invited to join him on his ‘Walk Across San Pedro’ to show their support and be a part of his cause; and be sure to donate and support Rowan and the visually impaired children of Belize!